On Sun, Jan. 20th Women Bike, in collaboration with Friends on Bikes, will be hosting a community ride to the Reclaim MLK Day March. 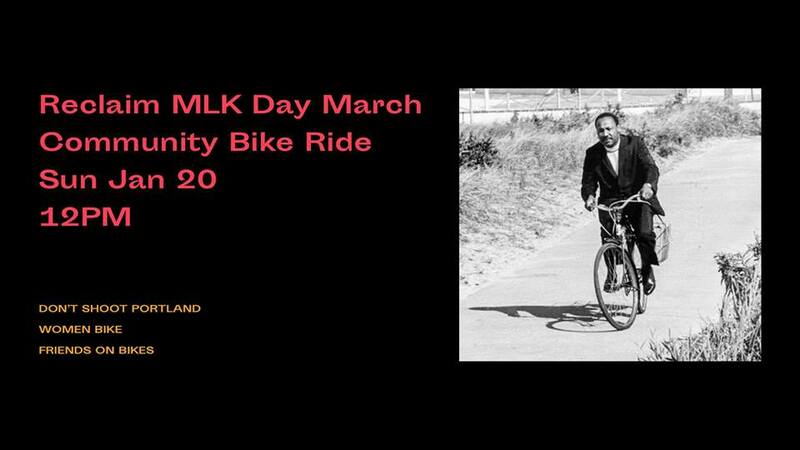 It will be a casual 5 mile ride, starting on the Eastbank Esplanade outside of Fire and Rescue Station 21, riding up the Esplanade to Williams, up Williams to Rosa Parks, then arriving at Reclaim MLK Annual March for Human Rights and Dignity @ Peninsula Park. There we will dismount and join the march. You may walk with your bikes or lock your bikes up at the park. Don’t Shoot Portland has asked for support with corking for the march. Under Dont Shoot’s direction you would ride 1-3 blocks ahead to cork traffic with your bike or hang out at the tail of the march corking traffic until everyone has passed through. DM Women Bike if you are interested in volunteering for this task. This is a beginner friendly, no drop ride. What to bring: Helmet, Water, appropriate weather gear, lock. Dont Shoot Portland is collecting food and clothing donations for local families, consider bringing a donation! This ride is open to everyone, although Women Bike and Friends on Bikes typically host exclusive rides to create safe spaces for under-represented cyclists and aspiring cyclists in Portland.